As good a composer as Brian Tyler is – and, make no mistake about it, he is a great composer – it’s been quite a while since he knocked my socks off. His monumental first ‘big’ scores Darkness Falls and Children of Dune in 2003 were the high water mark of his early career; since then, scores like Godsend, Constantine, Partition and Alien vs. Predator Requiem contained a number of memorable moments, but never quite attained the heights those initial impressive works attained. With Eagle Eye, Tyler has changed that: for the first time in half a decade, Tyler’s music reaches those lofty perches and, most importantly, sustains them over the course of a long album. 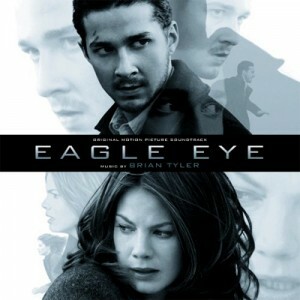 Eagle Eye is a kinetic action/thriller directed by D.J. Caruso and starring Shia LaBeouf as Jerry Shaw, a twenty-something slacker who, after the mysterious death of his twin brother Evan, finds his life turned upside down when he is framed as a terrorist, and blackmailed by a mysterious woman who can apparently control all electronic devices. He teams up with young mother Rachel Holloman (Michelle Monaghan), who has been similarly framed and, with the help of FBI agents Rosario Dawson, Michael Chiklis and Ethan Embry, races to find the source of the real terrorism threat, and clear his name. Some unkind critics have pointed out that this is the second film in succession where LaBeouf performance has consisted solely of him running away from things that are exploding; however, the film must be doing something right, having taken $35 million in its opening weekend. After a somewhat subdued opening minute or so in the introductory “Eagle Eye”, the funky-sounding bass-led ostinato main theme is introduced, and then the brasses come in with an effortlessly cool variation, building up the expectation and the tension, until the “Main Title” kicks in and the orchestra absolutely roars into action. The action music in Eagle Eye is simply immense, most notably in the aforementioned main title, and in later cues such as “Escape”, “The Case”, “Injection”, “Operation Guillotine”, the incendiary “Potus 111”, and the simply staggering “Clutch Then Shift”, which is one of the most uncompromisingly thrilling action set pieces I have heard in some time. The intricacy of the writing, the way it combines with the excellently-programmed electronic elements, the intensity of the percussion… it’s one of those scores which, if you were to play it loud enough, would literally shake the foundations of your house. Cleverly, Tyler maintains the presence of the main theme throughout the score, building it into the fabric of his action cues, and letting it come to the forefront when needed. The orchestral parts of the score are quite superb. Tyler uses cellos and basses to carry the main motifs for much of the time, which gives the score a sense of depth and power. The brass writing, when it is most prominent, is fiendishly complicated, and features difficult-sounding layering effects and performance techniques which make for fascinating listening. There are also several moments of explosive dissonance that Elliot Goldenthal would be proud to call his own. There’s even a hint of Don Davis and The Matrix in parts of “Escape”, in the way the brasses mutate and echo in and around themselves. The string writing in “The Case” is especially splendid, and it’s testament to Joel Iwataki’s recording that one can pick out the details from such a solid piece of music. The other thing I like about the score is the fact that, whereas other scores are diluted and made to sound thinner by the inclusion of synths, Eagle Eye is definitely enhanced by them. The electronic sound palette that Tyler employs is superb; it adds a layer of contemporary energy to the score, and roots it firmly in the modern technological age, but more than that it gives Tyler the freedom to play with a much broader musical palette which, in turn, makes the music sound richer and more vibrant. You can hear this in cues like “Ladders”, where the synths duet with the galloping strings and dazzling brasses at the top of the sound mix, or in “Ariia”, where the electronic textures give the music a clinical, slightly other-worldly feel. There’s a brief rock music interlude in “Copyboy”, a half-grunge, half-country piece in which electric guitars and slide guitars combine to great effect, and are kept in check by a sultry synth pulse. It’s also worth mentioning the inventive percussion Tyler uses throughout the score – everything from snares to tom-toms to marimbas rattle and dance in the background, keeping the internal tempo high and driving the music forward, but also adding interesting and varied colors to different cues. “The Case” is especially notable for its use of vaguely Indian-sounding percussion, almost like a set of tablas, which give the cue a definite exotic flavor. There are a couple of moments of down time. “Honor” introduces a noble, bittersweet theme for strings which, although still performed at a fairly heightened tempo, is still less of a force than the cues that surround it. It reappears towards the end of “Ariia” along with a warm piano line, and is developed more fully, albeit with a tragic twist, in “Loss of a Twin”. A criticism regularly made of Tyler’s albums is that they often seem just too damn long; usually, I would agree, but with Eagle Eye, the time just flew by. Despite the majority of the time being taken up with this massive action music, and despite it blasting away for over an hour, it never really becomes overwhelming, and never outstays its welcome. Perhaps the creativity of the music kept my attention longer, but whatever the reason, by the time it was all over, I was ready to spin the thing again. This is a score which will definitely appeal to fans of the Hans Zimmer-style of action scoring, but in saying that I don’t want to dissuade people who don’t like that style from checking this score out, because the negative preconceptions some people have about that kind of score don’t apply here. Essentially, what Tyler has done is take the basic elements that Zimmer fans enjoy – the huge orchestra, the prominent electronics, the occasional rock elements, the fast tempos – and made them much, much better. The only thing missing is a male voice choir! This is the great action score Zimmer hasn’t written for a decade, but which people keep wishing he would. This is the great action score that Klaus Badelt, Ramin Djawadi and the rest have never come close to writing. In fact, Eagle Eye is better than pretty much every action score produced by both Media Relations and Remote Control over the last few years, and as such comes with an unequivocal recommendation. Music composed and conducted by Brian Tyler. Performed by The Hollywood Studio Symphony Orchestra. Orchestrations by Robert Elhai, Brad Warnaar, Dana Niu, Andrew Kinney and Jeff Toyne. Recorded and mixed by Joel Iwataki and Brian Tyler. Edited by Joe Lisanti Album produced by Brian Tyler.